“Ikebana is an ancient art, which entered Japan along with Buddhism. The flowers used were traditional ones, like azaleas, offered to the deity in monasteries,” explains Malathi Pandurang, chairperson of the Sogetsu Study Group. Pandurang goes on to describe how, in an ancient monastery in Kyoto, a priest sat observing a pond and the flowers that grew on it. It occurred to him to use both these as elements of art , “which is why the art form is called Ikebana; ‘ike’ means water and ‘bana’ refers to plant material.” Pandurang has been practising this art for the past four decades, and follows the Sogetsu school of Ikebana. It is one of myriad schools, each with its set of rules and techniques of arrangement. Through her study group, Pandurang and her team have been working to learn, teach and spread this art in Chennai. The other reason for this choice of style is the availability of flowers in the region. “Unlike our tropical flowers, which are strong in scent but with short lives, traditional Japanese flowers would last in the the monasteries for a week,” she says. In Chennai, the team uses pre-cut flowers, as well as fresh seasonal flowers. “The seasonal peacock flower is one of those we prefer to give students who are just starting out,” she says. Her authority on the subject is well founded. Over the years, Pandurang has stayed in touch with every single Iemoto — or grandmaster — of the original Sogetsu school in Japan, and witnessed the direction each one took the art form towards. 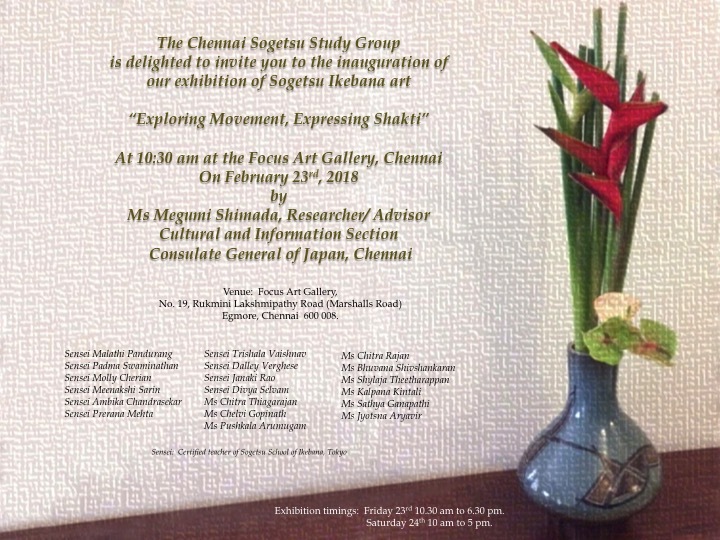 The Chennai Sogetsu Study Group will showcase its work at an exhibition ‘Exploring Movement, Expressing Shakti’ at Focus Art Gallery, on February 23 and 24. Flower arranging dates back to ancient Egypt. Apparently, the Egyptians were the first to cut and place flowers in a vase to decorate and add colour to their surroundings.